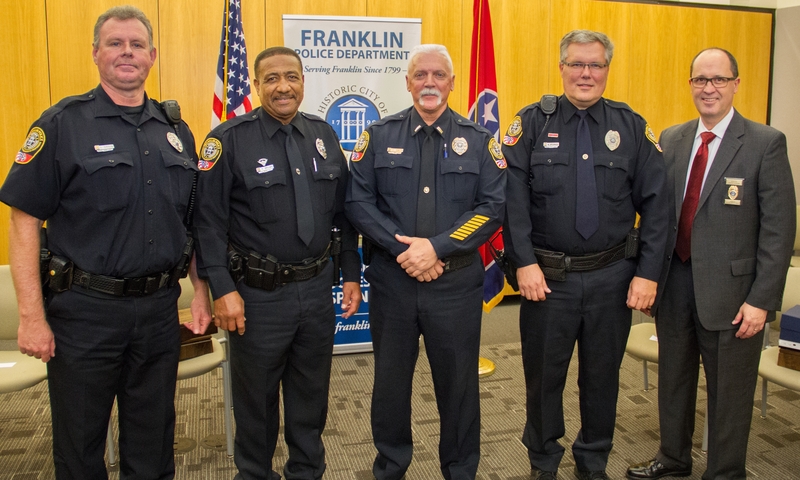 Yesterday, in a formal ceremony at Police Headquarters, Franklin Police Officers and City Officials honored the 142 cumulative years of service of five retiring Franklin Police Officers. Officer Mike Spearnock’s first day on the job was October 2, 1989. Officer Spearnock comes from a family of police officers and public servants. His assignments through the years have included Patrol, Field Training, Segway and Bicycle Patrol, and time in the Department’s Criminal Investigations Division. Prior to joining the Franklin Police Department, Officer Spearnock was a pitcher for the California Angels. Officer Jim Gibson started his career as a Franklin Police Officer on February 1, 1988. Officer Gibson’s assignments include Patrol, Public Housing, Criminal Investigations, and the FPD Youth Explorer Program. Prior to his service to our City, he served our Country, and was Honorably Discharged from the United States Army at the rank of Sergeant in 1987. Officer Gibson said that his work as a police officer has left an unmistakable soft spot in his heart for kids. Officer Roy Brown’s career as a Franklin Police Officer began on July 23, 1984. He has worked in Patrol, SWAT, Field Training, and the Traffic Unit. A 1967 graduate of the last class of Natchez High School, Officer Brown fondly remembered his time as an officer when he helped create and manage Midnight Basketball with the Franklin Boys & Girls Club, designed to help keep kids off of the street and out of trouble on the weekends. Detective David Dixon joined the Franklin Police Department on January 1, 1990. He credits his upbringing, as a preacher’s kid, with leading him to a life of public service. Detective Dixon, a Certified Fraud Examiner, has worked in Patrol, Field Training, Criminal Investigations, and as a Defensive Tactics Instructor. Detective Dixon said he was thankful for a good job that earned him a solid living, and the ability to help others. Lieutenant Carl Smith rose through the ranks after beginning his career with the Franklin PD on July 15, 1983. Twenty-four of his 32 years were spent on the Midnight Shift, protecting a sleeping city and its citizens. 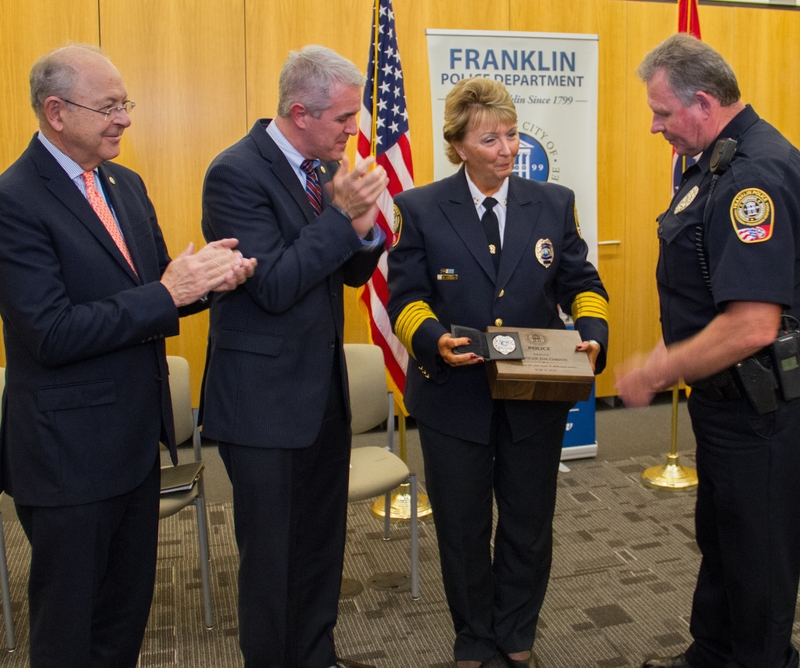 Lt. Smith is most proud of creating and helping to develop the Franklin Police Department’s award winning K9 Unit. He is proud that his son, Hayden, is following in his footsteps, now in his second year as a Williamson County Deputy Sheriff. 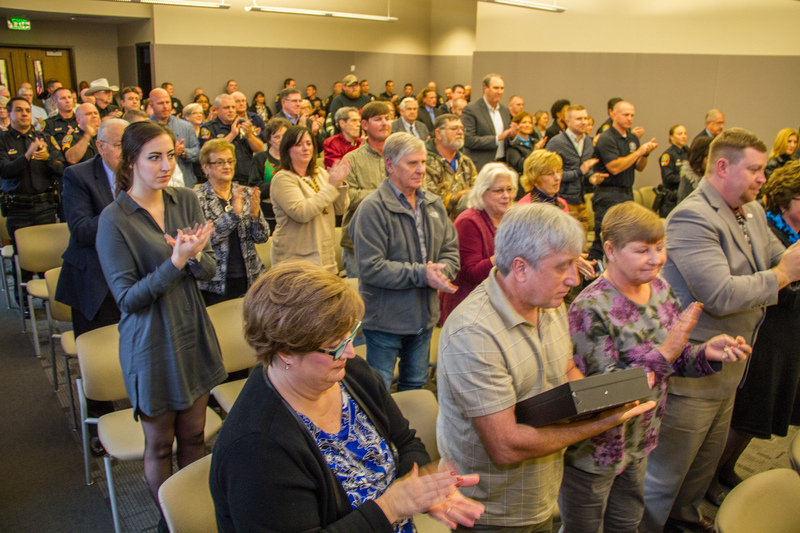 Each of the retirees say that they have built lasting friendships in the Department, and that – more than anything, it is the daily camaraderie they will miss most. Congratulations on your retirements! Thank you for your many years of service to our community!